Ravi Ravishanker is the CIO of Library and Technology Services at Wellesley College. He Manages 80 professional staff in the library/IT Services. As the Associate Dean of WellesleyX , Ravi helps produce & deliver the MOOCs through edX and blended learning activities at the College. 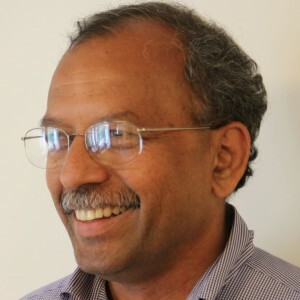 Ravi worked for 23 years at Wesleyan University in Middletown CT in various roles in both the Chemistry department and Information Technology Services before moving to Pace University as the VP for Information Technology for a year. He has been at Wellesley College for five years. Ravi Ravishanker earned his B.Sc. in Chemistry at SRKMV Arts College, his M.Sc. in Chemistry at Indian Institute of Technology, and his M.A. in Computer Science at Queens College of CUNY. In 1984 he earned his Ph.D. in Chemistry from Hunter College CUNY. He is an avid software developer and has developed several major software. His current interests include software development for the web as well as statistical data analysis, especially using R, which has nothing to do with the fact that his name begins in R.
You can find Ravi on Ravi’s Blog and Linkedin. You can also connect with him on Twitter @ravishan.